Yay for another milk tea joint inside of Pearlridge Mall! 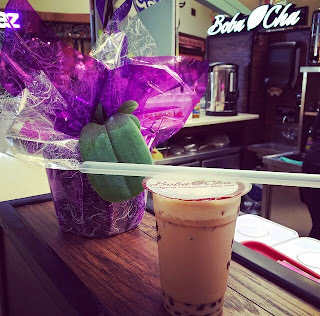 Boba Cha is located in Pearlridge Downtown near the escalators to the food court. When it comes to milk teas, I hardly ever stray from the original black milk tea with boba. The texture and the sweetness of the boba is most crucial to me and I was very happy that the boba at Boba Cha is delicious! The milk tea itself was on the sweeter side so I recommend customizing the sweetness to your tastes. Their menu is extensive so whether you're in the mood for a milk tea, a cookie monster frap, a sour plum lemonade, or just a plain iced coffee, they have you covered! Two drink sizes are available and prices range from $3.25 to $6.50. Boba Cha is a must stop for a yummy and refreshing treat.